This page covers the ingredients found in Body⇌Brain Energy™ and discusses WHY they work, including links to clinical and scientific studies. You can also see "recommended use" instructions. Recommended Use: As a dietary supplement, take 2 pills first thing in the morning with a big glass of water (empty stomach or before eating). IF needed, you may take 1-2 more pills 4 hours afterwards. Do not take late in the day as it may cause insomnia. Potential Side Effects: Insomnia, if taken too late in the day. Warnings & Interactions: If you have a medical condition, are pregnant, lactating, trying to conceive, under the age of 18, or taking medications, consult your health care practitioner before using this or any new nutritional product. Keep out of reach of children. *** contains about 10 mgs of naturally occurring caffeine, which is roughly 5% of a cup of coffee. 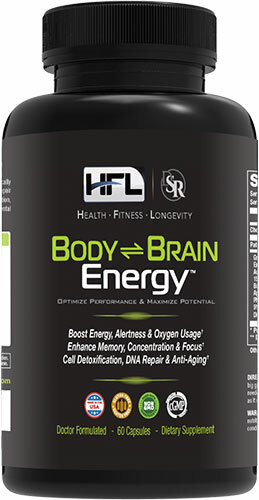 Below you'll find detailed descriptions about the ingredients utilized in Body⇌Brain Energy™ - exactly HOW it works & WHY it's better than other products. To get started, simply click on the descriptions below and a detailed overview and summary will appear under it. Neuravena® Wild Green Oat extract inhibits the monoamine oxidase-B (MAO-B) enzyme. This is important, because age-related decline in dopamine is largely caused by rising levels of MAO-B. In a double-blind, randomized, placebo-controlled trial utilizing this same ingredient in Body⇌Brain Energy™, there was a 74% improvement on a standard test of mental acuity 6 and 57% improvement in mental processing time and speed 24. Velvet Bean extract is guaranteed to provide 20% catecholamines, including L-DOPA, a precursor to the catecholamine neurotransmitters dopamine, norepinephrine, and epinephrine. While L-DOPA can cross the blood-brain barrier, dopamine cannot, making L-DOPA the preferred compound to elevate brain dopamine levels. NOTE: The L-theanine used in this product is Suntheanine®, the only pure form of L-theanine protected by 40 U.S. and international patents and scientifically proven in clinical studies to be safe and effective! You may not be able to stop stress, but for longevity and health reasons, you need to give your body specific nutrients to help manage and reduce "stress side-effects". NOTE: Sensoril® is produced with specially cultivated Ashwagandha that's purified through a patented process, concentrating the active constituents to levels never before achieved (32% oligosaccharides, 10% withanolide glycoside conjugates). Thus, every single capsule delivers the same stress-fighting support. Plus, Sensoril® features not just the maximum amount of active agents, it features them in the proper ratio for optimum results. No other Ashwagandha supplement compares! NOTE: We utilize the clinically researched Sharp-PS® Green form of Phosphatidylserine because it comes from a vegetarian source which is free from soy allergens, and is non GMO and eco-friendly. N-Acetyl Tyrosine is an amino acid that can be converted in the brain and in the adrenal glands to dopamine, norepinephrine, and epinephrine (adrenaline) hormones that are depleted by stress, overwork and certain drugs. By replenishing norepinephrine in the brain, mental energy levels may be improved. The N-Acetyl version of Tyrosine is more stable and soluble, thus resulting in greater bioavailability. Nootropics, a Greek word meaning 'Towards the Mind', are compounds that are both (1) neurologically active and (2) directly or indirectly enhances cognitive potential via increased capabilities (ie: reflexes), state of well being and learning potential. They are known as cognitive enhancers, which are dietary supplements that help optimize brain functions and improve brain health. Their mode of action is similar to "smart drugs". Noopept has a similar effect to Piracetam, one of the oldest and most researched Nootropics with over 40+ years of data.33 The primary difference been that a much lower dosage is required to see and feel the positive effects. Noopept is one of the most effective and strongest of all the Nootropic supplements on the market today. It has been found improve memory, learning capacity, focus, and concentration.32 It also promotes significant neuro/brain protective effects. Most people don't know that the brain requires a great deal of oxygen and circulation. In fact, cerebral blood flow is about 15% of cardiac output... Which is where all of your "blood" pumping is done. Proper brain health, diseases prevention and anti-aging benefits, requires optimal cerebral circulation and oxygen utilization. NOTE: We are utilizing the most potent form of Ginkgo with the highest extract: 24% ginkgo flavone glycosides, 6% total terpene lactones, <1ppm ginkgolic acid. NOTE: Unlike some other rhodiola supplements, w only use the authentic Rhodiola rosea species, and is standardized to contain 3% rosavins and not less than 1% salidrosides — matching the concentrations used in clinical trials. This means more cellular energy for your body! NADH is a natural coenzyme derived from vitamin B3 (niacin), which is essential for basic metabolism, respiration, the breakdown of sugars and fats, and the production of ATP, the primary energy molecule in our cells. NADH supplies ATP energy to the brain, nerves, muscles, heart and all other organs. Known as "cellular dynamos," healthy mitochondria produce the energy that powers all your cells. As people age, however, mitochondria both lose function and decrease in number. Our unique Mitochondrial Optimizer™ blend was formulated to enhance mitochondrial function, protect delicate cellular structures, power-charge metabolic processes, and aid in the creation of new mitochondria. CoQ10 (Kaneka QH Ubiquinol®) is an essential nutrient your body requires for healthy mitochondrial function, a process that produces body energy at the cellular level, from fats and sugars.42 CoQ10 also has powerful antioxidant properties, protecting important proteins43 and mitochondrial DNA44 from oxidative damage. NOTE: The traditional form of CoQ10, ubiquinone, is difficult for the body to absorb. But another form, ubiquinol, has been shown to absorb up to 8 times greater than ubiquinone, especially if you're over the age of 40. Kaneka QH Ubiquinol® is the only bio-identical CoQ10 available. "Increase My Energy & Feel Younger" Click to view this week's special discounts.